Born in 1915 as the son of a painter-decorator, Exner first studied at the Academy of Visual Arts in Vienna under Boeckl and Fahringer. In 1939 he was drafted into the military. Although he was often stationed at the frontline during the war, he always had his paints and brushes with him to capture on paper the things which moved him. After the Second World War, he left the armed forces and settled down in Wagrain. 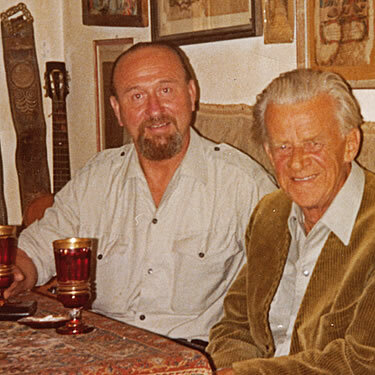 Erwin Exner was the head of the tourist office for many years and founded the local history museum association, whose honorary chairman he was until his death. This association was the predecessor to today`s „Blaues Fenster“ cultural association. He was very active in Wagrain , working together with culture in the local community, founding a singing group, initiating sporting events and integrating himself in many local associations. For this reason he was presented with the “Golden Ring of Honour of Wagrain” in 1975. Exner’s industrial pictures are also well-known : he was not afraid of putting factories, building sites or a dock in the middle of an idyllic landscape. He was also interested in graphic studies of movement, especially in the area of sport. Erwin Exner tried out many different artistic techniques, from pencil sketches to copper engravings, from watercolours to oil paintings, and the design of anything from textiles to facades. However, his preferred and distinguishing techniques were those of drawings, watercolours and sgraffiti. 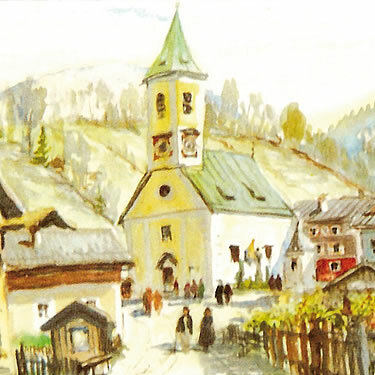 In 1992, the Wagrain local council decided to buy a representative cross section of Erwin Exner’s work for the council archives. 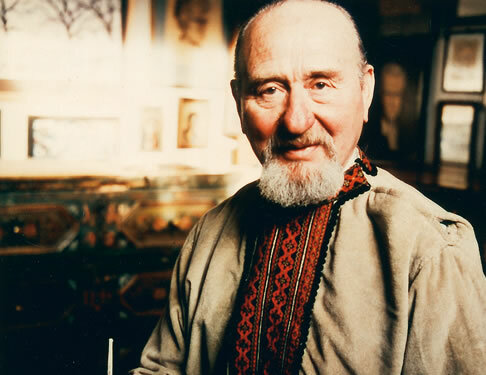 The painter, Erwin Exner, died in 1995 shortly after his 80th birthday.